Substance use issues continue to be a priority concern for First Nations people in Canada. The primary network in place to respond to First Nations substance use issues is the National Native Alcohol and Drug Abuse Program (NNADAP) and the National Youth Solvent Abuse Program (NYSAP). This network of on-reserve addiction services includes 58 centres and more than 550 NNADAP community-based prevention programs. In addition to NNADAP/NYSAP, First Nations people also access a wide range of substance use and mental health-related services from other sectors within the health care system both on- and off reserve, as well as other systems, including social services, child welfare, justice, housing, education, and employment. With the diverse systems in place to serve First Nations people, a challenge for communities, regions, and all levels of government is to coordinate a broad range of services and supports to ensure that First Nations have access to a comprehensive, client-centred continuum of care for substance use issues. As a key activity under the National Anti-Drug Strategy, the Assembly of First Nations (AFN), the National Native Addiction Partnership Foundation (NNAPF), and the First Nations and Inuit Health Branch (FNIHB) of Health Canada oversaw a comprehensive, community-driven review of substance use-related services and supports for First Nations people in Canada. This review was guided by the First Nations Addictions Advisory Panel, and was informed by the First Nations and Inuit Mental Wellness Advisory Committee’s Strategic Action Plan for First Nations and Inuit Mental Wellness, which was developed in 2007 to provide national strategic advice on efforts related to First Nations and Inuit wellness. From 2007 to 2011, the review included a wide range of knowledge-gathering and consensus-building activities, including regional addiction needs assessments; a national forum; a series of research papers; regional workshops; and an Indigenous knowledge forum. These activities directly engaged community members, treatment centre workers, community-based addiction workers, health administrators, First Nations leadership, provincial service providers, researchers, and policy makers to develop and shape a renewed approach for community, regional, and national responses to substance use issues among First Nations people in Canada. 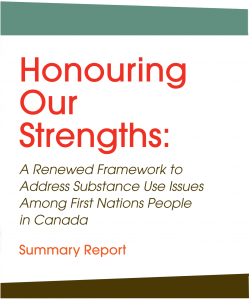 Honouring Our Strengths: A Renewed Framework to Address Substance Use Issues Among First Nations People in Canada was developed based on this process of engagement and feedback. Honouring Our Strengths outlines a continuum of care in order to support strengthened community, regional, and national responses to substance use issues. This vision is intended to guide the delivery, design, and coordination of services at all levels of the program. This approach recognizes that a wide range of individuals, organizations, departments, and other partners are responsible for addressing the substance use-related needs of First Nations people in Canada. The focus of the framework is on addressing substance use issues, however it also considers the important roles mental health and well-being play in all aspects of care, including prevention, early identification, intervention, and follow-up. This document provides a summary of the guiding principles upon which the framework approach is based; the six elements of a continuum of care to respond to the needs of individuals, families, and communities; and six key supports to the continuum of care. For the full version of Honouring Our Strengths and other renewal-related documents, please visit the process website at: www.nnadaprenewal.ca (URL). Spirit-centred—A system-wide recognition that cultural practices and traditions are essential to the health and wellbeing of First Nations people. These practices and traditions are recognized as the outward expression of spirit; and that the revitalization of spirit is central to a strengthened system of care. Connected—Strong connections are the basis for holistic and integrated services and supports. These connections exist between Indigenous people, the land, and their culture, as well as relationships between various sectors and jurisdictions responsible for care delivery. Resiliency-focused—While trauma contributes substantially to both addictions and mental health; there is a need to recognize, support, and foster the natural strength and resilience of individuals, families, and communities. These strengths provide the foundation upon which healthy services, supports, and policies are built. Holistic Supports—Services and supports that consider all potential factors contributing to well-being (e.g., physical, spiritual, mental, cultural, emotional and social) over the lifespan, and ensure that these needs are addressed through a comprehensive, integrated continuum of care. Community-focused—Community is viewed as its own best resource with respect to the direction, design, and delivery of services. Adopting a community-focused lens will help to both ensure that diversity within and across communities is respected, and enhance overall system responsiveness to factors that make each community unique. Respectful—Respect for clients, family, and community should be demonstrated through consistent engagement, at all levels, in the planning and delivery of services. This engagement must also uphold an individual’s freedom of choice to access care when they are ready to do so, as well as seek to balance their needs and strengths with the needs of their families and communities. Balanced—Inclusion of both Indigenous and Western forms of evidence and approaches to all aspects of care (e.g., service delivery, administration, planning and evaluation) demonstrates respect and balance. It is also important to maintain awareness that each is informed by unique assumptions about health and well-being and a unique worldview. Shared Responsibility—Recognition of the individual, shared, and collective levels of responsibility to promote health and well-being among First Nations people. This begins with individuals managing their own health and extends to families, communities, service providers, and governments who have a shared responsibility to ensure services, supports, and systems are effective and accessible, both now and for future generations. Culturally Competent—Cultural competence requires that service providers, both on- and off-reserve, are aware of their own worldviews and attitudes towards cultural differences, and include both knowledge of, and openness to, the cultural realities and environments of the clients they serve. Culturally Safe—Cultural safety extends beyond cultural awareness and sensitivity within services and includes reflecting upon cultural, historical, and structural differences and power relationships within the care that is provided. It involves a process of ongoing self-reflection and organizational growth for service providers and the system as a whole to respond effectively to First Nations people. Co-ordination among partners and sectors to provide effective, client-centred services and supports. The six elements of a continuum of care are intended to respond to the needs of individuals, families, and communities with a range of substance use issues. They are also designed to meet the needs of specific population groups (e.g., women, youth, and people with co-occurring mental health issues). Health promotion activities which build on community and cultural knowledge. These efforts help people engage in safer and healthier lifestyles, create conditions that support such lifestyles, and restore healthy and supportive family dynamics. Ongoing aftercare for those who have accessed treatment services and require life-long, holistic support from their communities and a range of service providers. A range of efforts (e.g., case management) that will ensure clients are connected with care options specific to their needs and supported throughout their healing journey. Discharge planning and aftercare efforts that work with a client and their support networks to ensure access to a range of care options that build on the treatment experience and address key social determinant of health areas (e.g., housing, employment, education, living conditions, and social support). Community-level capacity and support to effectively screen, assess, refer, and provide ongoing care to clients with complex substance use issues. These efforts may draw upon a range of community services and supports, and require a high level of collaboration. Ongoing follow-up with a client that acknowledges what they have achieved, and connects them to the care options they need. The following are six key supports to the continuum of care. Personal wellness supports for workers to reduce burnout and support retention. Establishing and maintaining strong system-level partnerships and linkages among governing bodies, health, and social service providers that promote collaboration at the community, regional and national levels. Multidisciplinary team approaches that are responsive to the needs of the community. Knowledge exchange activities on research findings, policies, and practices to strengthen service and support at community, regional, and national levels. Multidisciplinary team approaches to care that help address the complex needs of clients on medications. Ensuring follow-up and continuous improvement by implementing recommendations made and following up with the accreditation body. 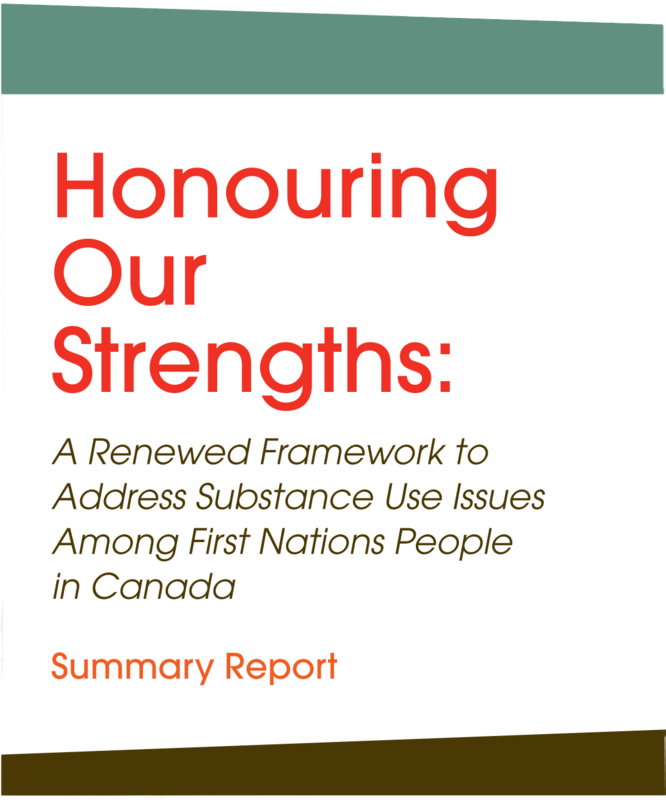 Honouring Our Strengths outlines a vision for a comprehensive continuum of services and supports to guide community, regional, and national responses to substance use issues among First Nations people in Canada. This vision recognizes that a strengthened system of care is the shared responsibility of various jurisdictions (community, province, federal), as well as a wide range of care providers including family and community members, community service providers, primary care and other medical staff, and off-reserve service providers. Within this vision, the emphasis is on ensuring that people, families, and communities have access to a range of effective, culturally-relevant care options at any point in their healing journey. Realization of this vision will require ongoing commitment, collaboration, and sustained partnerships. Commitment and collaboration will, in turn, depend upon effective leadership throughout the system. The NNADAP Renewal Leadership Team was formed in 2010 to exercise leadership in guiding the implementation of Honouring Our Strengths. The Leadership Team, with support from AFN, NNAPF, and Health Canada, will work with various networks and partners toward strengthening the system of care for First Nations people. However, solutions for renewal must also come from First Nations people, who own the vision of the framework and must guide its implementation in order to ensure the system remains responsive to their needs. Implementation of this framework will involve developing tools and guides to support partners at all levels. It will involve ongoing communication through established networks (e.g., AFN First Nations Health Technicians Network; NNAPF regional networks; Regional Addiction Partnership Committees; the Youth Solvent Abuse Committee; and Health Canada First Nations and Inuit Health regional offices). It will also require identification of opportunities to positively influence change, optimize the use of existing resources, and identify new funding opportunities. While Honouring Our Strengths provides a comprehensive vision for the renewal of First Nations substance use-related services, it is recognized that the framework must be viewed as a living document, which can be adapted or revised based on the evolving Indigenous and mainstream evidence base, as well as the changing needs and realities of First Nations people. Over time, this will require integrating programs for tobacco abuse, problem gambling, and other addictive behaviours. It will also involve efforts to create a fully integrated mental wellness continuum of services and supports. The opportunities that exist to strengthen the system of care are great. Many First Nations cultural teachings indicate that the Creator gave everyone tomorrow to make a difference, and with this promise of tomorrow comes responsibility. Everyone involved in this framework must manage the responsibility of “tomorrow” so that collectively, we can pursue our vision for change.